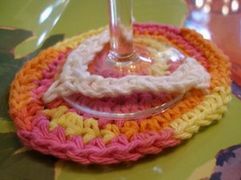 Crochet these coasters in multiple colors and everyone will know which beverage is theirs! And since the coaster stays with the glass, you’ll avoid rings on the furniture (as well as drips). These make great party favors too! Rnd 1 Ch 3, 8 sc in third ch from hook (do not join rounds, use a scrap piece of yarn to mark beginning of rows). With contrasting color (white in photo) attach with a single crochet in first stitch marked in Rnd 5, sc in next st of Rnd 5. Ch 10, sc in next st marked in Rnd 5, Ch 10, sc in last st marked in Rnd 5, sc in next st of Rnd 5. Next row Ch 1, turn, sc in first two sts, sc in every other ch, sc in next sc, sc in every other ch, sc in last two sc. Fasten off, weave in ends. Insert glass and enjoy!